The International Museum of Surgical Science, a division of the International College of Surgeons (ICS), maintains over 10,000 square feet of public galleries committed to the history of surgery, and an exquisite permanent collection of art and artifacts from the history of Medicine. The Museum supports its Mission through medically themed exhibitions and programs, in addition to a strong contemporary art exhibition program. The Mission of the Museum is to enrich people’s lives by enhancing their appreciation and understanding of the history, development, and advances in surgery and related subjects in health and medicine. 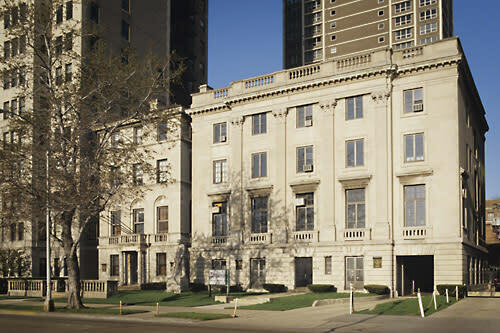 Housed in a historic mansion on Lake Shore Drive, the International Museum of Surgical Science spans the history of surgery by means of art, books, medical instruments and artifacts. The Museum’s collections and exhibitions portray the mysteries, breakthroughs, failures, and milestones that have shaped modern surgical science. Our four floors are filled with extraordinary artifacts, as well as paintings, illustrations and sculptures that interpret the ancient and modern healing practices of Eastern and Western civilizations. Of special interest to those in the medical field, our collection appeals to anyone interested in history, science, architecture, or classical and contemporary art.